Beat-Man with his scratchy, sinister voice, is the founder and president-for-life of this company. This record shows him all over the place, even trying his hand at what sounds like Russian folk music. And there's even a near-7-minute sermon, "The Beat-Man Way," in which Beat-Man shares his theological insights. For loads of fun, check out the Rev's podcast (with Gringo Starr) Sonic Nightmares on Garagepunk.com Click HERE for the podcast feedplayer. 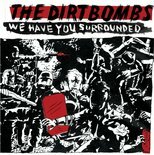 * We Have You Surrounded by The Dirtbombs. Nothing like a little apocalyptic paranoia to make a body want to rock. And you’ll find plenty of that on this new album by The Dirtbombs. On nearly every song singer/guitarist Mick Collins seems to be looking over his shoulder and not liking what he sees. Civilization is decaying, burning. The future’s so dim Collins can’t wear his shades. The end is near and everyone’s out to wreck his flow. The Dirtbombs is one of the many Detroit bands of the 1990s that didn’t become famous when The White Stripes rose. (But don’t call his group a “garage band, or Collins will twist your head off and eat your children.) With a lineup that includes two bassists and two drummers, Collins pays vocal tribute to the soul greats of his hometown’s past. I'll have more to say about this album in an upcoming Terrell's Tune-up. Stay tuned. * Rib Tips and Pig Snoots by Andre Williams. After seeing Andre at SXSW, I couldn't wait for his upcoming release on Bloodshot Records. I needed some Andre now -- so I downloaded this collection of early material. Just like I hoped for, these songs, recorded back in the '60s, are funky, raunchy and funny. It was great seeing Andre at the Yard Dog last month, but damn, I wish I could have seen him back when these tunes were recorded. *Live, Raw & Funky by Ike & Tina Turner. Few bands matched the raw intensity of Ike & Tina at their peak. 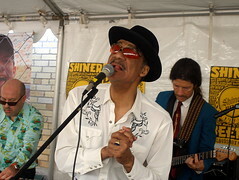 This set includes lots of their own hits ("Nutbush City Limits," "Ooh Poo Pah Doo," "Proud Mary," "River Deep, Mountain High") covers of hits of that era ("Respect," "Son of a Preacher Man," "I Heard It Through the Grapevine") and some good old blues like the near 10-minute "I Smell Trouble," showcasing Ike's guitar as well as Tina's voice. One of my favorite moments is Tina's rap during the middle of "Respect": "I want to talk about soul music" she says. "I wanna talk about it because you see, soul is what I call grease. Comes from the kitchen, that's where you cook it." Some of the sound quality isn't great here. But it's good and greasy. the soul burns through. Bassholes is a two-man blues/punk/garage band -- originally from Columbus, Ohio -- working the same side of the street as The Flat Duo Jets and early White Stripes. Through much of their career they've been compared with The Jon Spencer Blues Explosion -- though they never got nearly as famous. They play mainly originals, tough rock seeped in raw blues. One of my favorites on this album,(released in 2000 and recorded live at a radio broadcast) is the discordant "Bowling Ball." How could you not love a song that starts out, "There's a bowling ball in the back seat of the killer's car ..."? 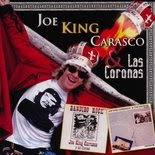 * Bordertown & Viva San Antone by Joe "King" Carrasco y Los Coronas. At one point in the early-to-mid '80s, Joe "King" Carrasco & The Crowns practically were the house band at Club West in Santa Fe. They were playing here every time you turned around. And what a show Joe put on! He literally climbed the walls. His frantic Farfisa-fueled "Nuevo Wuevo" -- a hopped-up fusion of mid-'60s Chicano garage rock and Tex Mex cantina music was an irresistible invitation to hop around and sweat. Carrasco was known as the personification of "Party Party Weekend" and his music embodied that notion. But by 1984, Joe was getting pretty pissed off at the Reagan administration's Latin American policies. His album Border Town, which makes up about of this collection had loads of rocking fun. But there were songs that showed Carrasco had another side too. "Current events are making me tense," he says in the opening tune. But even stronger was "Who Buy the Guns" was about the murder of four American nuns in El Salvador by right-wing death squads. It was almost like an outtake from The Clash's Sandinista!, but it rocked more convincingly.